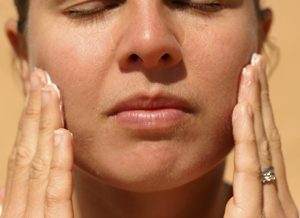 Rosacea, like acne, is not fully understood. However, intestinal bacteria may play a significant role. If you suffer from rosacea, you know that it is different from the ordinary “garden variety” acne. A mild case can result in a slight flushing in the middle of your face, while severe cases will show excessive redness in the cheeks and nose, greasiness, enlarged pores, lumpy swellings, thickened skin and often permanent scarring. Eyelids may redden and the mucous membranes of your eyes can sting and burn with conjunctivitis. Additional symptoms may develop such as red domed papules (small bumps) and pustules, red gritty eyes that burn and sting, and in some advanced cases, a red lobulated “W.C. Fields” nose. Many times, the highly strung, intense personalities who fall victim to rosacea are mistaken for heavy drinkers. However, rosacea seems to have genetic ties. It affects more women than men, especially emotional, rosy, fair, thin-skinned women with tempers, but symptoms are more pronounced in men. Not usually apparent in youth, rosacea develops over a period of years, with its peak onset between the ages of 30 and 60. Suppressing emotions such as fear and anger will increase occurrences, as will the anticipation of important events or unpleasant scenes. This also heightens the damaging potential to the skin. After dilating repeatedly, blood vessels lose the ability to shrink, and the face stays flushed. Rosacea, like acne, is not fully understood. However, intestinal bacteria may play a significant role. In a recent study, when given a hydrogen breath test that detects bacterial overgrowth in the small intestine, significantly more rosacea sufferers were found to be hydrogen-positive than the control subjects. The rosacea subjects were given a 10-day course of rifaximin, a non-absorbable antibiotic that does not leave the digestive tract to reach the skin. These studies may shed light on new treatments for rosacea sufferers, given the symptomatic improvement experienced when they also reduced their carbohydrates, which in turn, restricted bacterial fermentation. Julia Busch is president of Anti-Aging Press, Inc., editor of the So Young™ anti-aging holistic newsletter and author of more than 30 books. juliabusch@att.net or AntiAgingPress.org.